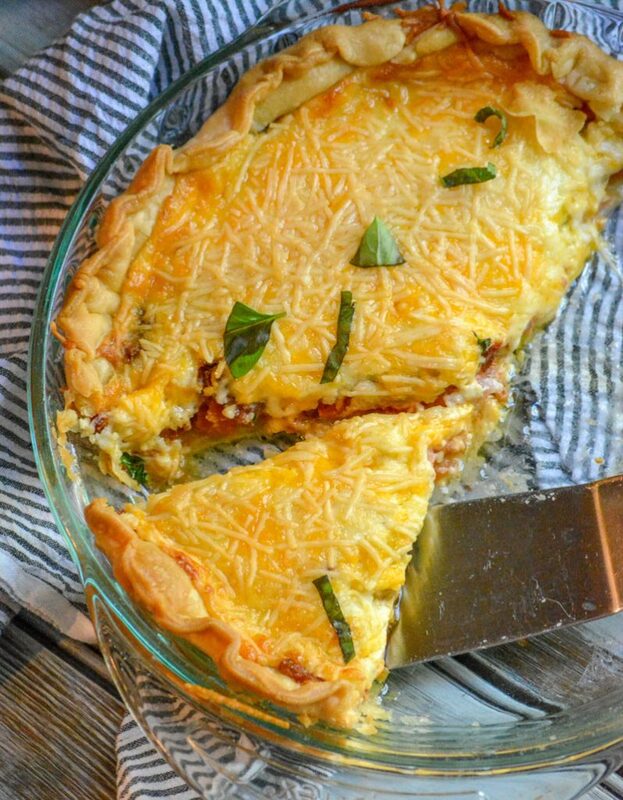 This Tomato Pie is a perfect way to use up some produce. 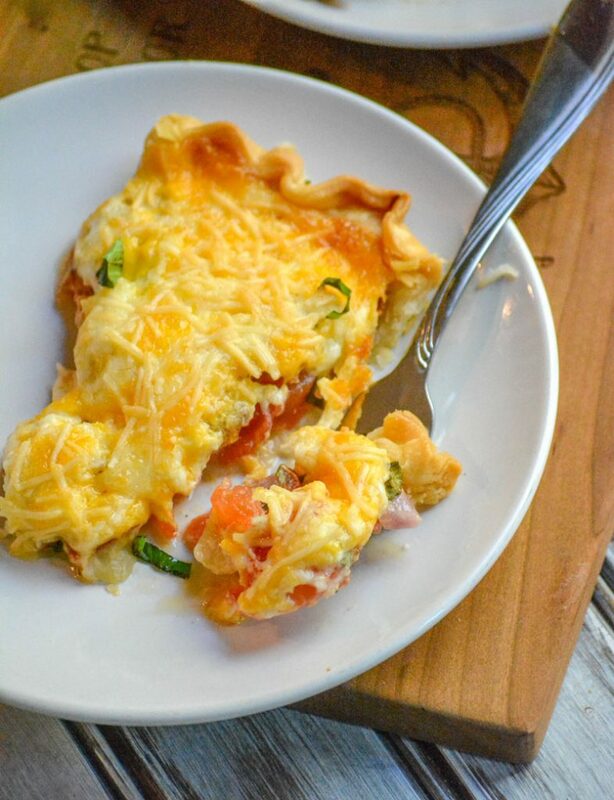 With thick slices of juicy tomatoes, fresh basil leaves, & bright red onion- it’s piled high in a buttery pie shell & topped with a cheesy spread. Speaking of summer fun, and summer veggies as we have been around this neck of the woods recently I’ve got too bring up one of my favorite Summer show stoppers. The tomato. I grew up on the tomato. Some of my fondest memories involve the tomato. Specifically, my grandmas plain, but still out of this world tomato sandwiches on toast, and the first bite into one of her vine-ripened beauties every summer. Now that I think about it, almost every lunch and dinner included it some way, some how. And … IT. WAS. AWESOME. Then you’ve got the hubs. The Italian from a family of second generation Italian immigrants from up North. His idea of the tomato growing up was something to be included in pasta sauces and dishes, and something to be picked out of his salad. And not a darn thing changed for him even when he moved down South. Seriously. 30 years later, and I’m still trying to change this. Imagine his horror when we married and he found out I’d serve a whole meal based on nothing but, you guessed it, THE tomato! 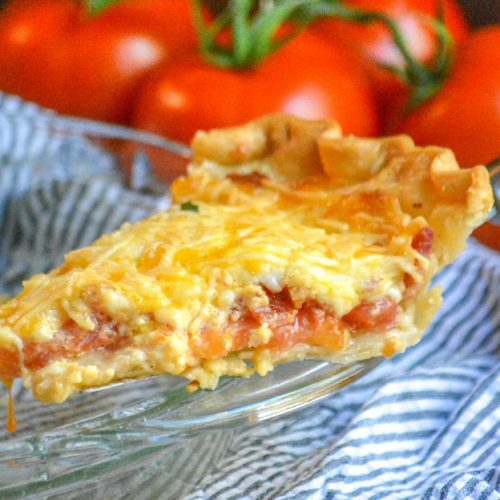 Tomato Pie is pretty much everything the name implies. What the name alone doesn’t tell ya? Just how dang delicious it is. There’s no way to prepare for it. I may have to baby the hubs a bit with paper thin slices in his servings, but the rest of us bite into our bits of tomato ‘steaks’ with relish (not actual relish, promise). Either way, this is the one dish where even the hubs leaves no tomatoes behind. We have several versions of this dish that we enjoy, but this one is our favorite. Your vegetarian family and friends will thank you. Your carnivorous spouse and offspring will never even miss the meat. Tomato pie is actually a pretty simple recipe, and assembly’s quick & easy. A couple steps are key though. With the tomatoes, peel & slice them, and place them in a single layer of a large strainer. Liberally salt them. This is going to draw out all the moisture locked in them, which will prevent a soggy pie later on. Let the salted tomatoes drain for a full ten minutes. Transfer them to paper towels, and pat them dry with extras. Remember, we’re trying to get as much extra liquid out as we can. Just don’t press down too hard so they don’t get squished. 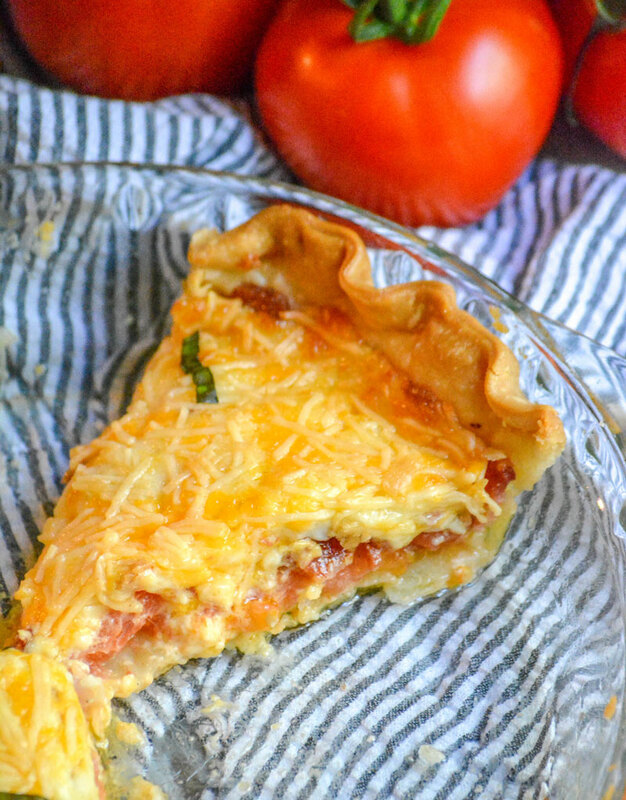 Layer the prepped tomatoes, fresh basil leaves, and sliced red onions in the pie shell. Season with salt & pepper. In a separate bowl, combine the cheddar & mozzarella cheeses and mayo until everything’s evenly combined. Add the mixture in dollops evenly out over top of the veggies. Using a spatula, evenly spread the mixture. Sprinkle the Parmesan cheese evenly out over top. 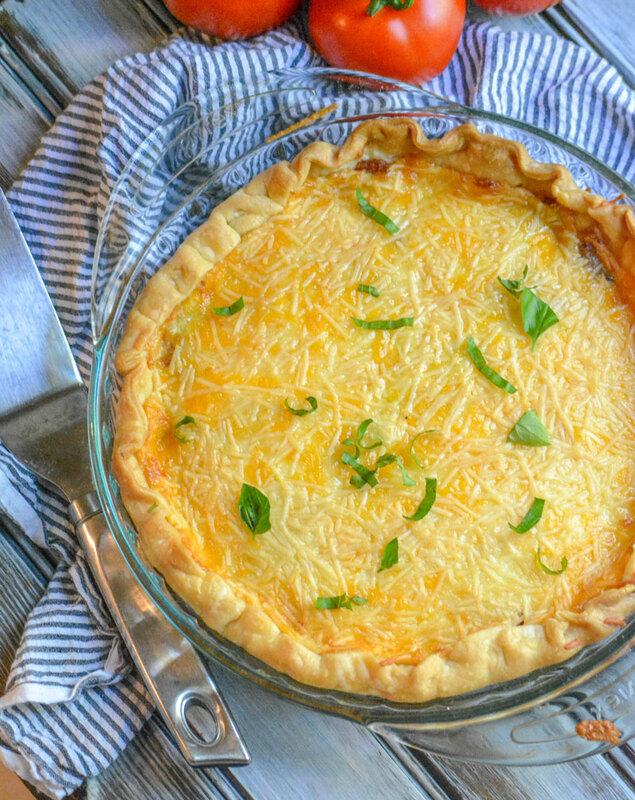 Bake the tomato pie at 350 degrees for 30 minutes, or until the cheese has formed a crust & turned golden brown. Once cooked, let the pie rest for a full 5 minutes before slicing and serving. The wait time’s important so that the pie can set. Otherwise, it might fall apart when trying to scoop out. 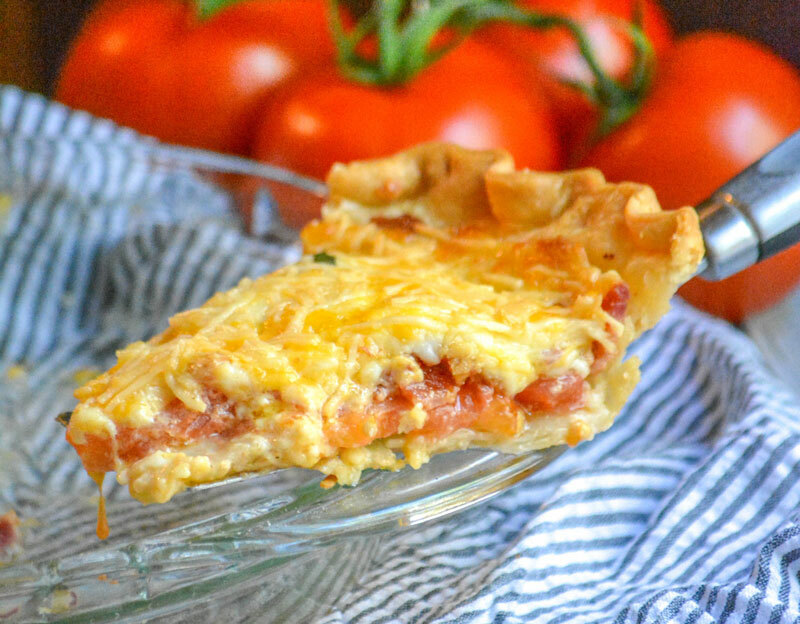 If you grew up loving the tomato sandwich as much as I did, then this tomato pie is bound to be an epic hit. Take advantage of sales, or just the regular Spring and Summer produce surplus- and add this flavorful vegetarian meal to the menu. You’ll have zero regrets! 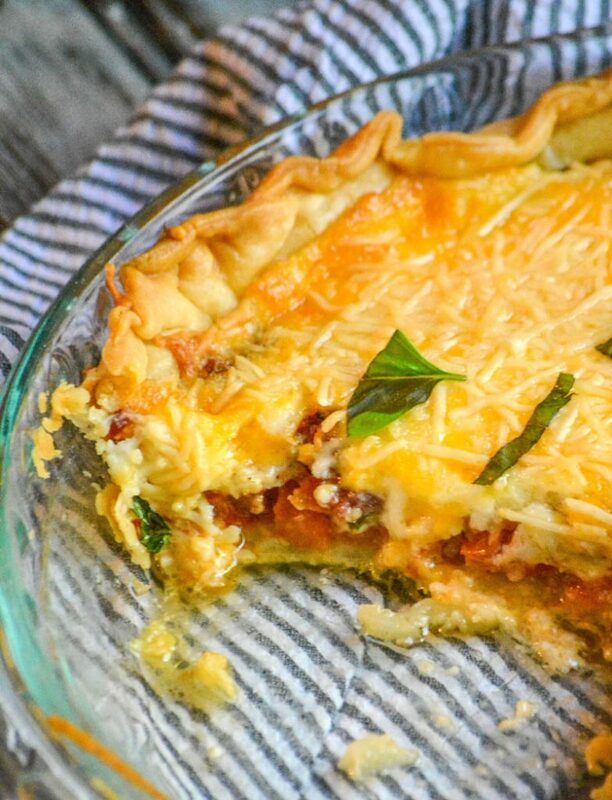 The perfect pie for Spring & Summer, this dish features thick tomato 'steak' slices and tangy red onion slathered with a creamy cheesy topping all tucked in a flaky pie crust shell. Place the tomatoes in a clean colander/strainer in the sink in 1 layer. Sprinkle with salt and allow to drain for 10 minutes. Use a paper towel to pat-dry the tomatoes and make sure most of the excess juice is out. (You don't want wet (juicy) tomatoes or your pie will turn out soggy). Layer the tomato slices, basil, and onion in the prepared pie shell. Season with salt and pepper, to taste. In a separate bowl, combine the cheddar and mozzarella cheeses and mayonnaise. Spread the mixture out evenly on top of the tomatoes and sprinkle the parmesan cheese on top. Bake at 350 degrees for 30 minutes or until the cheese mixture is lightly browned. Let the pie rest for a minute or two, then cut into slices and serve warm. Oh, my God! This looks so, so very gorgeous!